Join us at Wednesday January 30 at 7pm for the third in our series on dementia. 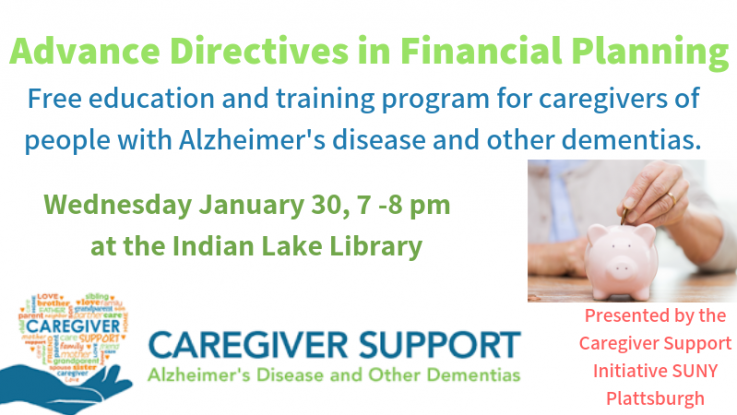 This month’s topic is called “Advance Directives in Financial Planning”. The Caregiver Support Initiative will once again provide valuable information for the people caring for loved ones with Alzheimer’s disease and other dementias. Financial planning is a very important when a loved one is in need of care, but it can be a difficult topic to tackle without a road map. This program will answer some of your questions about how to start planning for a future with dementia, and what resources are available to families in need of providing long term care. For more information prior to the program, call Stacey Barcomb at (518)832-4992. This program is free of charge.